ONCHAN, Isle of Man – April 27, 2017 – The second millionaire from the PokerStars Makes Millionaires promotion has been made. ‘nick2101983’ won the Millionaire Grand Final tournament, taking home the $1 million first place-prize money at PokerStars, an Amaya Inc. (Nasdaq: AYA; TSX: AYA) brand. The 33-year-old defeated 41 players from 19 countries, topping off the hard-earned victory with a pair of aces in the final hand. You can catch the excitement from PokerStars Team Online’s Felix “xflixx” Schneider’s stream the moment ‘nick2101983’ won here. The Millionaire Grand Final tournament lasted 90 minutes, meaning the player earned over $11,000 per minute whilst becoming the 201st poker millionaire made at the world’s largest online poker room. 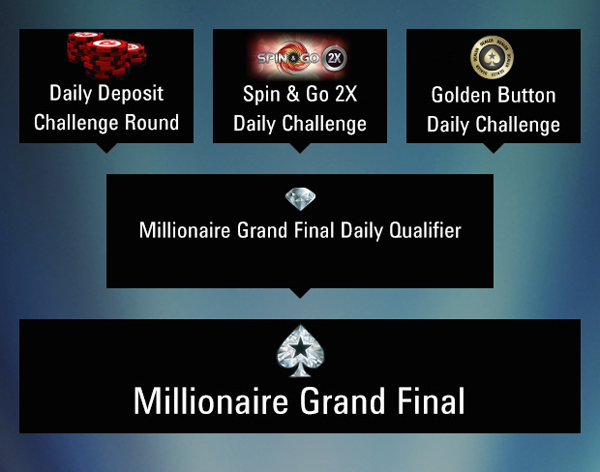 ‘nick2101983’ secured the seat at the Millionaires Grand Final in just two days by completing the Spin & Go 2X Daily Challenge and Millionaire Grand Final Daily Qualifier. The player told their mother and nobody else that they were in with the chance of becoming a millionaire because they wanted to keep luck on their side, which clearly worked. The poker player who works as a captain’s assistant on a ship plans on celebrating the win by buying an apartment and a new car. No one walked away empty handed as all 42 participating players were awarded a $1,050 Spring Championship Of Online Poker (SCOOP) ticket that can be used in the Phase 1 High event which runs daily, culminating in a tournament on May 21 at 12:30 ET with a top prize of $1 million guaranteed for the winner, giving all players involved another chance at becoming a millionaire.